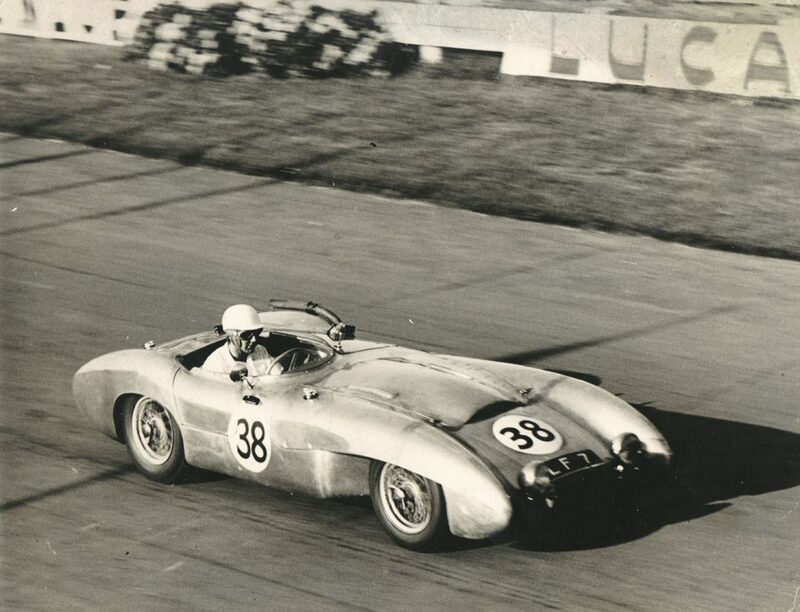 A remarkable collection of automobilia from the Sussex based 1950s motor racing driver, the late John Young, is to be sold at Toovey’s Washington salerooms on Friday 23rd February 2018. 1955 was an important year for British motor sport, especially in endurance sports car racing. In August 1955 John Young raced in the Goodwood Nine Hours Endurance Race here in Sussex driving a Lotus-Connaught. His co-driver was John Coombs. John explained to me “We were going well in the Connaught and racing into the evening until Coombs came in saying his hands were cold and borrowed my gloves. Shortly after that he turned it over but, thank God, he was alright!” The story was a timely reminder of how dangerous motor racing was in the 1950s. At the Le Mans twenty-four hours race in June 1955 Mike Hawthorn won in a works Jaguar D-type. In the early stages of the race Hawthorn raced closely with Fangio who was co-driving a Mercedes 300SLR with Stirling Moss. But the tragedy of the accident which resulted in a Mercedes disintegrating and killing some eighty spectators would overshadow Hawthorn’s victory. Hawthorn was devastated. The beautifully crafted and poignant ⅛ scale hand-finished model of Mike Hawthorn’s 1955 Jaguar D-type Le Mans winner is just one of the lots of automobilia entered from John Young’s collection and carries a pre-sale auction estimate of £600-£900. John Young’s great friend, Roy Salvadori, would deliver victory at Le Mans for Aston Martin in a DBR1/300 sports car in 1959. 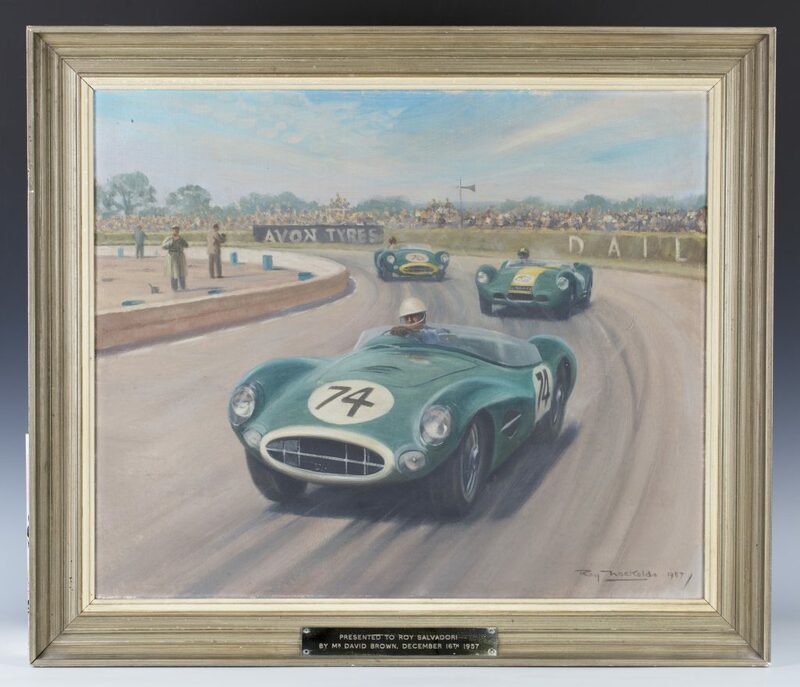 The evocative oil painting by Roy Nockolds of a DBR1/300 has a presentation plaque to Roy Salvadori from Aston Martin owner, David Brown, dated December 16th 1957. It is estimated at £800-£1200. John Young’s delight in sharing a story and his enthusiasm were balanced by his self-effacing modesty. A generous man, he epitomised the best of his era: a gentleman racer, a collector and an enthusiast with a deep love of life, cars and the Sussex countryside. His collection of automobilia will be sold at Toovey’s on Friday 23rd February 2018. For more information visit www.tooveys.com.